Whitsunday Moorings and Marine Construction has been in operation for over 10 years. With offices located in Airlie Beach and Hay Point we are your closest Commercial Dive Team with Full ISO 9001 Certification to fulfil all your diving requirements. Whitsunday Moorings and Marine Construction (WMMC) is a fully qualified ADAS Commercial Diving Company with Divers, Dive Supervisors, Diver Attendants and Master 5 Skippers, all staff are blue card inducted and have MSIC. Our Head office is located in Airlie Beach (the Whitsundays) and a satellite office in Hay Point, the Abbot Point anchorage is only 2.5 hrs north and Hay Point / Dalrymple Bay 5 hrs south. Our landside response is 1 hr to Abbot Point and 2.5 hrs to Hay Point and Dalrymple Bay. Our mobilisation times are ultimately short, thus cost effective. 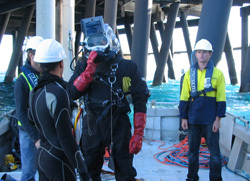 Whitsunday Moorings and Marine Construction Pty Ltd specialises in wet welding, ultra thermic cutting, EPA clearance reports, prop scrubs and sea chest clearing, leak identification, hull inspections, salvage and seabed clearance after capital works. All diving work is monitored on the surface by our qualified supervisor via a head mounted digital camera with topside display, hard drive recording and live audio feed. This makes us one of the safest operations in our area with the ability to pass on to the client real time images of work undertaken.